Provides bright, durable traffic markings. 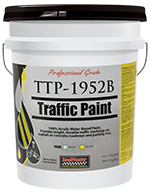 SealMaster TTP-1952b Traffic Paint is an acrylic water base paint meeting all requirements of Federal Specification TTP-1952b. Stir thoroughly before using. Use as is. Thinning with water should not be required..